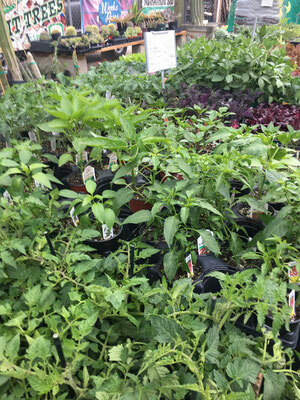 We carry many varieties of vegetable plants. They are usually sold in 6 packs or single 4 inch pots, depending on the kind of plant and availability. Please call us for current pricing. What we have in stock is largely dependent on the time of year. 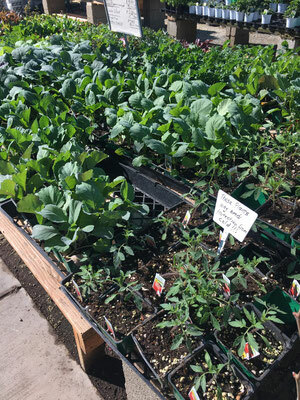 For example, in spring we will have many varieties of tomatoes, peppers, squash, and other warm season vegetables. In fall, we will have what are referred to as winter vegetables- leafy greens, peas, anything in the cabbage family, and root vegetables such as beets. Please call us to see what we have available. For full information on what vegetables to plant when, see the vegetable seasons list at the bottom of this page. 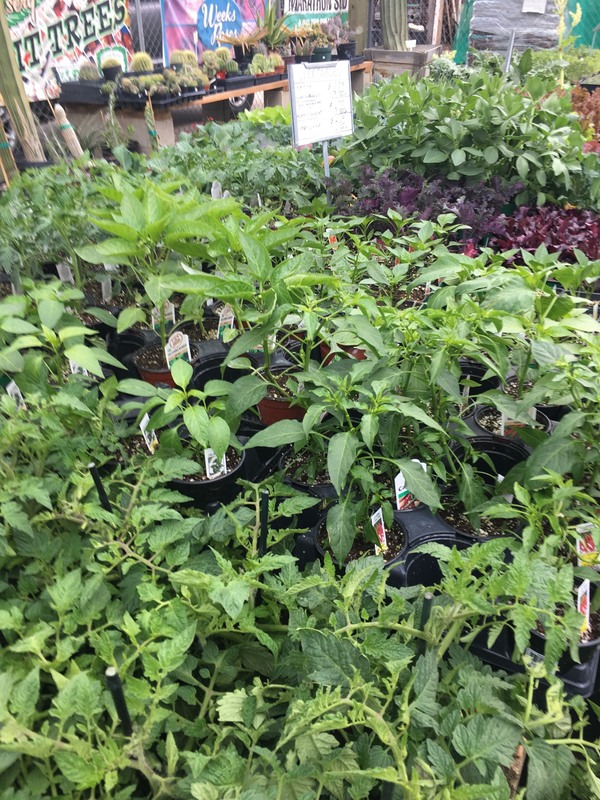 We carry a large variety of herbs year round. Many, like oregano, thyme, sage, and rosemary, are long-lived perennial plants in our area. We also carry parsley, cilantro, many types of mint, lemongrass and basil (seasonally), and some harder to find herbs such as rue and French tarragon. 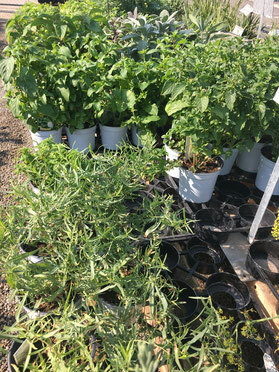 Our herbs are available in 4 inch pots, and certain ones are also available in one gallon size. Please call us to check pricing and what we currently have in stock. 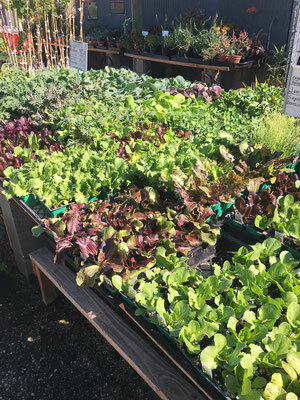 Fertilizing regularly throughout the growing season can really help your vegetable plants perform at their top capacity. We recommend Bumper Crop organic vegetable food about once per month. This will help keep those vegetables healthy and producing over a long season. 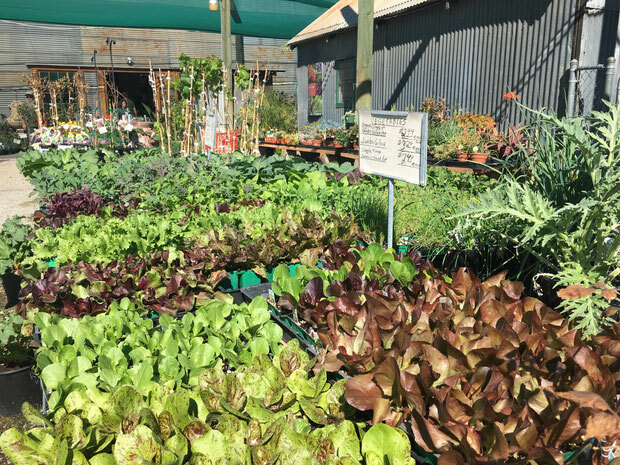 This lists the best vegetables for each season in our area. This is a list explaining the different types of tomatoes, and what varieties do best here. How much to plant to feed your family, planting dates, and when to harvest.